Our customers enjoy the granite! "Thank you. We love the lantern! It looks great. "The bench has arrived and been put in the perfect place in our garden. It is as striking as I had imagined. THANK YOU! If you ever need a testimonial, count on us." "I wanted to let you know how much I LOVE my lantern. It is the perfect fit for the space. We put the light kit in and it looks wonderful. So happy!" "I was hoping the flowers around it would be a little more in bloom, but still very pretty. Thank you!" "We love our little snow lantern. 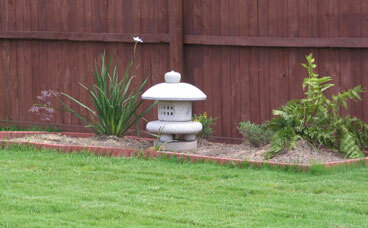 It is the perfect addition to our infant Japanese garden. Thank you so much for allowing us to own this treasure from your gardens." "The granite benches look great on our new patio." 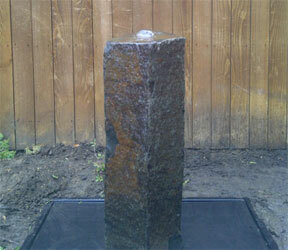 "Just wanted you to know that I received the beautiful, salt-and-pepper granite fountain stone. It really is something special. ... and it's going to be spectacular [when installed]." "Thanks again for my beautiful fountain. It looks - and sounds - great! It's up and running today." "Just thought I'd let you know that the guide stone arrived last week. I lugged it across the yard and placed it and it looks fantastic. Thanks for your help and the beautiful addition to our garden." "Just a note to let you know that the bench arrived, has been picked up, and is already in place. Mom said to tell you that she is "VERY PLEASED" with the way it turned out. Thank you so much!!!!! I have to admit that I was a bit skeptical ordering this over the Internet without being able to see anything firsthand. I will be going down to view it next weekend. Can hardly wait to see it. Once again, THANK YOU for your products and your patience." "Thanks for the red granite guide stone. It's perfect." 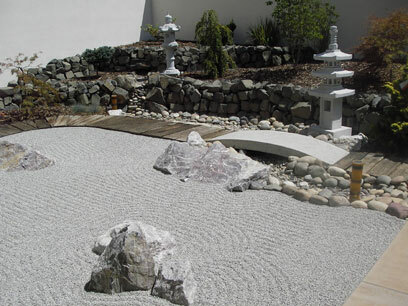 This customer bought several granite sculptures and created a beautiful Zen garden in New Fairfield, Connecticut. 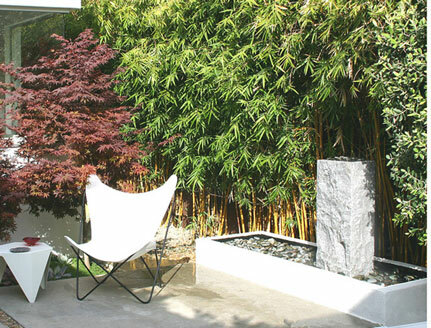 Click here to see some of the Zen garden. 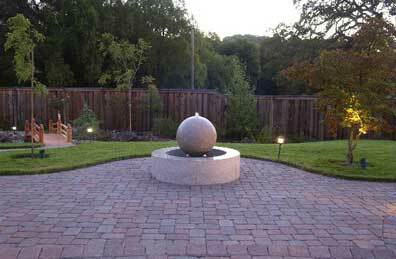 "Thought you might like to see my near completion back yard. I'm very happy... Thanks!" "Hi! The Buddha arrived safely yesterday. We are very pleased with our purchase, and your prompt service. Thanks." 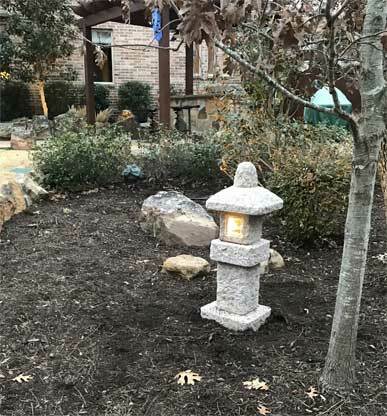 "We are VERY happy with our lantern - it's a beautiful addition to our yard and pond. It's comforting to know that there are still companies in business who care about their customers! You are one of them!!! Thanks." "I picked up my bench today in Sacramento. 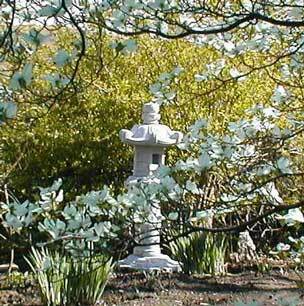 It is set up next to my koi pond and near the Miyoshi lantern and Zenigata basin that I acquired from you in the past. The bench is as good or better than I anticipated. [freight company] was good to deal with and loaded the heavy bench with a forklift for me. This has been a pleasant buying experience in all respects. Thanks." "Just a short note to express my great pleasure with my Zenigata basin. ...Everything was delivered as promised and on time, and the quality exceeded my expectations." "We finished installing the granite piece we purchased from you. We are very happy with the way it looks and really enjoy sitting in the benches and reading in front of the fountain." "The basalt column fountain is installed. We still need to get shim rock and river rock around the base but you can certainly get the idea. We are inching toward the finish line of our yard installation!! Just wanted you to know that the stone went to a good home!" "Thank you for the prompt shipment. The Miyoshi lantern arrived in perfect order and we have it set up. It's beautiful! It looks nice now but I expect it to look gorgeous once the granite has "aged." 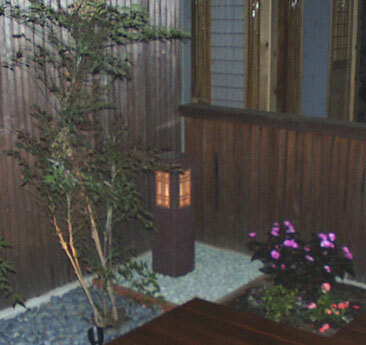 "The Miyoshi lantern arrived today and it looks great!" "I finally set up the lantern where I want it to be. Of course, there remains a lot of landscaping to be done around it, but I am very happy with it. At the moment, the area is like a well-prepared canvas for me to paint on. I can build a whole garden around it. Thank you for the lovely lantern. I've waited so long to have this lantern." "The granite bench is even nicer than I expected!" "Just to let you know that the lanterns arrived today and I am very pleased. They are already in the garden and they're just right. 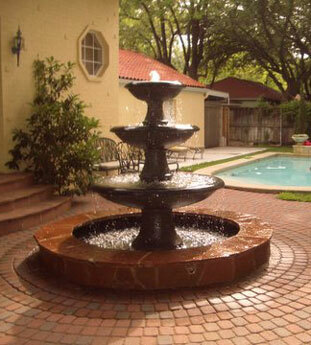 Thanks"
"Thanks so much for your assistance in designing our custom fountain. It arrived on schedule and the shipping was even less than expected! We're happy with the final result. 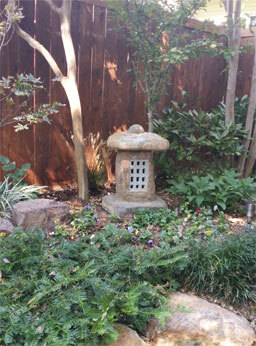 The fountain fits with our Japanese garden, unlike the wedding-cake fountains that we saw at other sites." 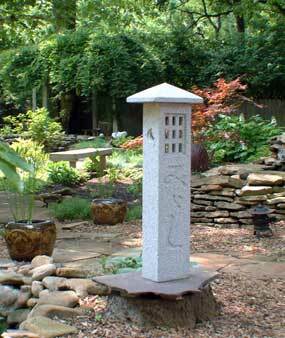 "We wanted to let you know that we picked up the granite pagoda on Saturday. We really love the pagoda and are glad that we ordered it! Thanks again!" "The very heavy lantern arrived. It is going to be lovely when I get it moved... Thanks and I'll be ordering again soon." "I like it even better than I thought I would!" "Just wanted you to know that the little lantern is an intriguing presence. It's perfect at the end of one of our multitude of stone walls. I'd like to order another piece from you, the 2' rustic guide stone." "I received the stone yesterday. I'm quite happy with the products, which meet my expectations exactly. Thank you." "I bought a fountain from you last year. 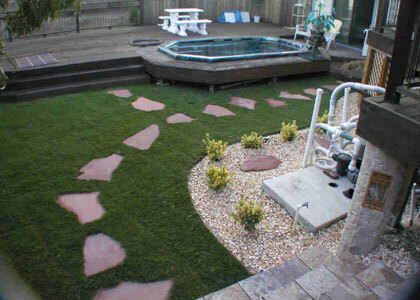 Now, I want to order some stepping stones and another fountain." "I finally got four guys to carry this monster down and install it under the deck... It looks great, well worth the wait." "Called to tell you that the  bench and  bridge look lovely in our garden. "We want to let you know that we received the benches and the [Kotoji, Miyoshi, and Oribe] lanterns and that we are really pleased with them. They are very beautiful. We're looking forward to receiving the two [special order] pagodas."